New 3D Store Open for Divergent Novels – Featuring Exclusive Tee Design by Author Veronica Roth! You are here: NECAOnline.com » Blog » News And Announcements » New 3D Store Open for Divergent Novels – Featuring Exclusive Tee Design by Author Veronica Roth! 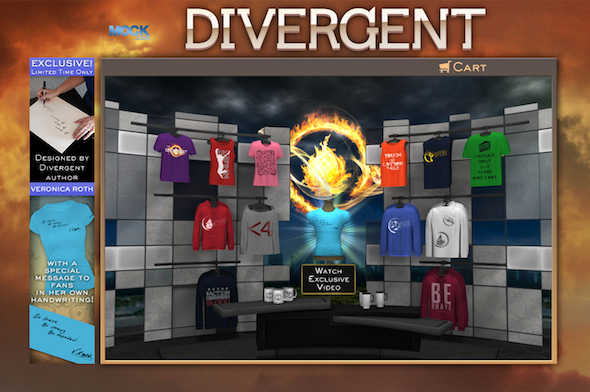 The best-selling Divergent novels have their own 3D store at Mock.com, where fans can customize apparel and accessories based on Veronica Roth’s books. To celebrate the occasion, for a limited time only, the store will feature an exclusive shirt design, with a special message to fans in Veronica’s own handwriting! Each tee can be personalized with different colors for both fabric and printed art, plus special printing effects, making it a collaborative creation between you and Veronica Roth. exclusive video of the author creating the shirt’s design! Here you can create your own merchandise featuring themes and art from the Divergent novels in a fun 3D shopping environment. Choose your product, customize your design, play with the colors — your item will be one of a kind and made just for you. You can even share your designs with friends!